The backstory of Aesop's latest fragrance, Hwyl, is a hodgepodge (to which I'll contribute). Hwyl is a Welsh word (pronounced, rapidly: WHO-will); according to the Oxford English dictionary, it means "a stirring feeling of emotional motivation and energy." Yet, Hwyl's perfumer, Barnabé Fillion, when asked by Philippa Morgan in Vogue Arabia, "How would you describe Hwyl in one sentence?" responded "The silence and verdancy of an ancient Japanese forest, and the wind in the canopy." Hwyl reminds ME of India — the scent of altars and old-style Ayurvedic apothecaries. To each his own! Hwyl presents lots of "sticky," rich and earthy frankincense (as if it had been dug from wet dirt). There are also scents of dried herbs and camphor swirling in the air (thus the medicinal smell of a shop selling natural medicines). As Hwyl dries down, smoky vetiver (with a strange tinge of mint and vanilla) becomes apparent, but frankincense and water-logged evergreen aromas never disappear completely. While wearing Hwyl, I smell like an ancient wooden medicine chest, musty and pungent with decades of absorbed aromas of powders, creams, tinctures and oils. Hwyl is a powerful perfume; one spritz on the back of my cold, chapped hand (not a spot to encourage a fragrance to "bloom" and diffuse) attracted lots of attention...for hours, even from people outdoors on a frigid day. Hwyl then survived a hypothermia-curing scalding shower at home. I enjoyed Aesop Marrakech and Mystra, and Hwyl goes well with those "antique"-smelling perfumes. (Tacit I dislike.) For those of you who absolutely hated Gucci Guilty Absolute Pour Homme (one of my top perfume picks of 2017), I predict you will hate Hwyl, too (the perfumes are similar). If you loved Guilty Absolute Pour Homme but wished it was stronger...grab some Hwyl to sample. Aesop Hwyl features notes of vetiver, frankincense, cypress, thyme and moss. It is $125 for 50 ml Eau de Parfum. 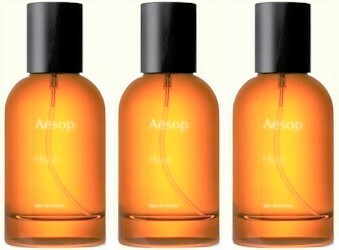 For buying information, see the listing for Aesop under Perfume Houses. 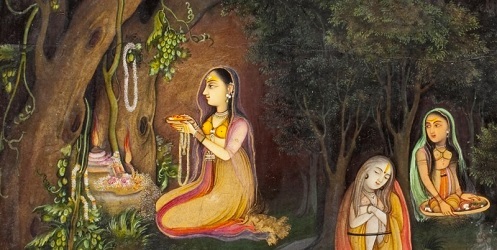 Note: top image is A Princess Visiting a Forest Shrine at Night [cropped] via Wikimedia Commons. Nice review! I have worn Hwly a couple of times and to me it smells like walking on the hills in Central Otago (NZ) sun-burnt dry hillsides of wild thyme, pine and fur with a kind of damp greeness from the large river that flows through it all. But I’ve never travelled to the Middle East, Japan or India. I really like the dry-down and think the perfume is at its nicest after 2 hours. Also….it’s mid-summer here so I’ve been wearing it in the heat and that’s also been good (and probably relevant to my experience of it). I prefer Mystra of all the Aesops. I’ve also worn Tacit a lot recently. Kanuka: Mystra was my favorite fur sure (couldn’t resist! HA!) I loved how this one smelled after I showered…the extreme dry-down is lovely…takes a long time to get to it though. After smelling this at an Aesop boutique I couldn’t resist and finally got myself a bottle as a Christmas gift. I love it. The smokiness and the incense have such a calming effect to it. It does remind me of CdG Hinoki, but I’ve only smelled that one once only. On me I don’t find it powerful though. It is rather quiet, but tenacious and I can catch a sniff of it here and there during several hours. I should add that Aesop’s perfume samples are really not very practical for testing. They come in the form of a small piece of wet wipe soaked in perfume. It’s not easy to apply, most of the perfume is actually wasted on the cloth and on your fingers, and it’s hard to tell how it really performs in terms of longevity and projection. Bill, I prefer Hinoki to this one, it has “zing”…like sniffing from a bottle of turpentine. And, yes…those scent wipes are annoying! I bought this over the holidays. I loved Marrakech and anything hinoki. The first blast is piney on me, but throughout the day it mellows and warms. I like it and think I’ll put some on this morning! Aspara, it really suits this icy weather. Interesting! I love and own Tacit. And I very much liked Marrakech and Mystra. And I also had Gucci Guilty Absolute Pour Homme as one of my top picks of 2017. So, I think I’ll like this, despite our apparent disagreement on Tacit. Erin: I predict “LIKE” (tell me if I’m wrong). One of my fav releases of 2017. I would love for them to make a travel size bottle. Or a Shower Gel!!! Smokey: don’t know where you live, but Aesop boutiques are popping up everywhere. Wonders never cease: it’s hard to fathom how a mainstream Gucci could smell like an all natural Aesop! But both you and Kevin can’t be wrong on something like this. I’ll try to sample the Gucci, which would otherwise never have happened in a million years! noz: and let us know what you think. I’m anxious to try the “Absolute Femme’ version…but it’s not on the shelves in Seattle yet. Please tell me you get the similarity to Slumberhouse Norne too? I worked at Aesop HQ for two years and somewhere along the line I got a sample of Norne, at the same time as Hwyl was starting to make its way around the office. To me, Hwyl is a more ‘clothing friendly’ (wont stain them) version of Norne. It was also always very apparent when someone was wearing Hwyl, as it could be sniffed from a mile off.